Today is the birthday of artist Georgia O’Keeffe, born in Sun Prairie, Wisconsin (1887). She had her first exhibition in 1916, at photographer Alfred Stieglitz‘s 291 Gallery, without her knowledge. She had sent some of her charcoal drawings to a friend, who in turn showed them to Stieglitz, who hung them in his gallery. Within two years, he had convinced her to move to New York from Texas, where she’d been living and teaching. He encouraged her to devote herself to painting, promising to support her for a year if she did so, and he promoted her work enthusiastically, mounting one-woman shows at least once a year. By 1918, they were in love, and in 1924, they were married. She painted lush flowers, dramatic cityscapes, and bleached bones; he photographed her, more than 500 times over the years, his intimate portraits of her graceful, angular face telling a pictorial love story. “He photographed me until I was crazy,” she later said. Stieglitz and O’Keeffe wrote each other letters, a great many letters, sometimes three or four a day: 25,000 pages passed between them from 1915 to 1946. “I’m getting to like you so tremendously that it sometimes scares me,” O’Keeffe wrote in 1916. ” … Having told you so much of me — more than anyone else I know — could anything else follow but that I should want you …” He wrote to her in 1917, “How I wanted to photograph you — the hands — the mouth — & eyes — & the enveloped in black body — the touch of white — & the throat — but I didn’t want to break into your time …” The first volume of their correspondence, titled My Faraway One and covering the years from 1915 to 1933, was published earlier this year. 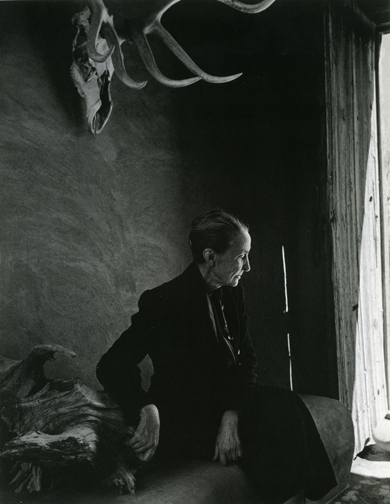 O’Keeffe’s other great love was the landscape around Taos, New Mexico. She took her first trip there in 1929, and returned every summer to paint. After Stieglitz’s death in 1946, she moved to New Mexico permanently. She gave up painting in oils when her eyesight failed in the mid-1970s, but continued to work in pencil and watercolor for several more years. In 1982, she began sculpting with clay, which she continued until two years before her death in 1986, at the age of 98. Do you live here in New Mexico? Have you read My Far Away One? ?